For questions regarding any of these materials please contact John Graham at . All the materials below can be used separately, but are designed to be integrated into a 2-day session on Inventive Negotiations. Many of these materials were designed for and can also be used with International Marketing by P. Cateora, M. Gilly, and J. Graham (15th edition, McGraw-Hill, 2011), China Now: Doing Business in the World's Most Dynamic Market by M. Lam and J. Graham (McGraw-Hill, 2007), New Japan: Doing Business with the New Japan by J.D. Hodgson, Y. Sano, and J. L. Graham (4th edition, Rowman & Littlefield, 2008), Global Negotiation: The New Rules by William Hernáez Requejo (Palgrave Macmillan 2008), and All in the Family: A Practical Guide to Successful Multigenerational Living by S. Niederhaus and J.L. Graham (2nd edition, Taylor, 2013). Please note that some of the files are quite large, so please be patient when downloading them. See a training video including Americans making negotiation errors with Mexican, German, Chinese, and Japanese counterparts. Download a RealPlayer version. Download user notes. 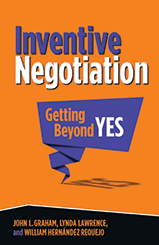 PowerPoint presentation associated with Inventive Negotiation: Getting Beyond Yes. Notes for instructors are included. Please download this file to your computer to view in PowerPoint. 2-person, buyer-seller game first used by H.H. Kelley is still useful. It requires about 15 minutes of preparation and usually results in about 30 minutes of interaction. The results can be compared to those listed in Exhibit 4.4 of Global Negotiation: The New Rules, page 85. This also ties directly to slides #s 77-80, 87-90, 99-105 of the PowerPoint presentation above. The products and currencies can be adjusted to fit your own context. 6-person, buyer-seller game, Bolter Turbines Inc. has been used with thousands of executives around the world. Feel free to adapt the materials for your particular contexts. A PowerPoint presentation is included. 6-person, buyer-seller game, General Medical MRIs is a spin-off of the Bolter Turbines game. It includes some "cultural materials" and can be used directly with the briefings on negotiation styles in 50 countries. Also, included is a PowerPoint presentation. Finally, this is the same simulation that provides the context for the Video Materials above. All of us who negotiate . and that really is all of us . would benefit from reading Inventive Negotiation. In clear prose and with wonderful examples, the authors explain the theory and practice of negotiation and how to foster long-term relationships. Every page is filled with insights that can benefit everyone, including even the most experienced negotiators.